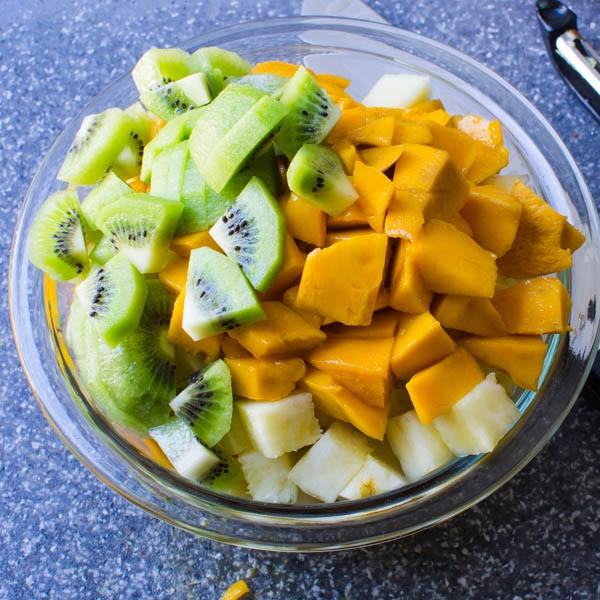 Want a healthy fruit salad with a little twist? 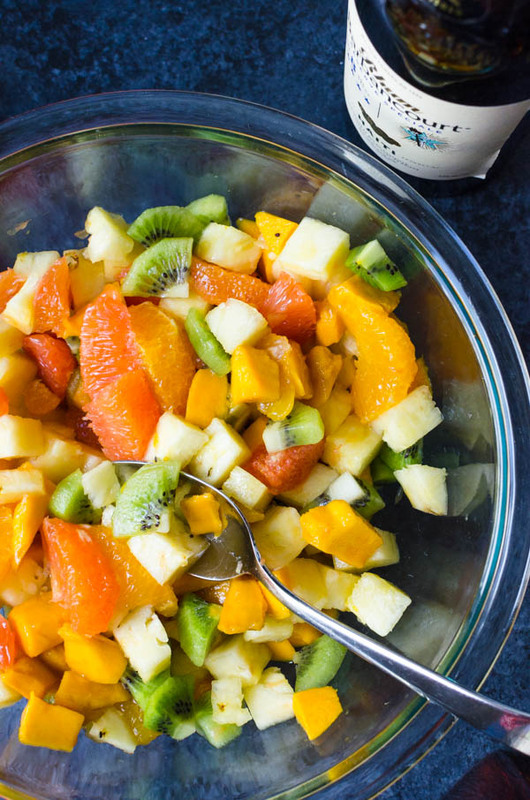 Rum-Spiked Tropical Fruit Salad is lush and sweet with toasted caramel notes of island rum. 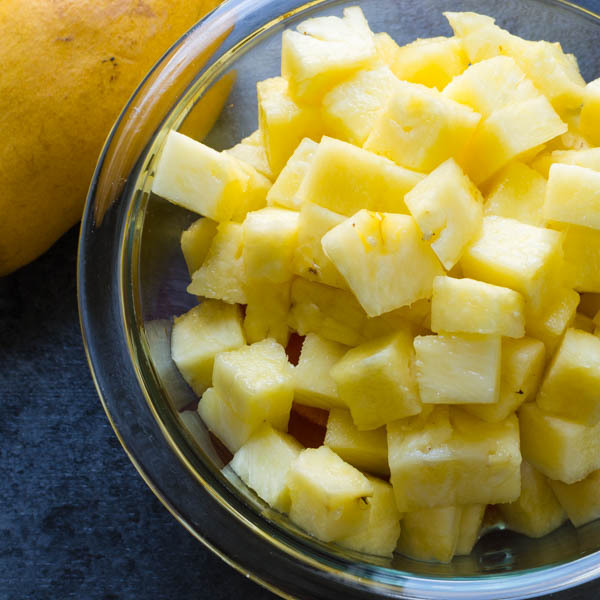 Perfect on its own, or spoon this tropical fruit salad over sponge cake for the perfect end to a summer meal. This is less of a recipe and more of a need to use up the boatload of tropical fruit I acquired while driving back across the state after my daughter’s college graduation. 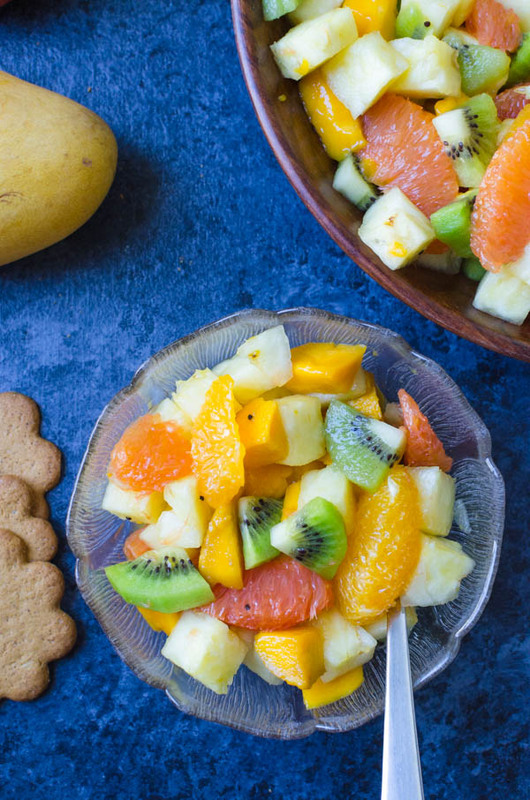 Despite its simplicity… or maybe because of it… Rum-Spiked Tropical Fruit Salad is one of my favorite ways to enjoy fresh fruit. I’m betting that you’ll love it too. So, here’s the scene: My daughter has resided in various dorms, apartments and shared domiciles with her friends for the past four years on the other side of the state. To visit her, we have to drive four hours on rural, two lane roads that, at some points, are more harrowing than I-95 at rush hour. The only reprieves are the little roadside stands dotted along the route, I wrote about my affection for them in this Peach Blueberry pie post. I am a sucker for anything sold on the side of the road, off the back of a truck and pitched precariously close to drivers going 80mph. Scott already knows that he’s obliged to stop for those hawkers, though I don’t think he minds. We stop and munch on samples while they regale us with anecdotes about why this is “the best strawberry season in a long time” or talk about the newly bred “Florida peaches — and how they’re smaller than the northern peaches, but taste so sweet…” and the tropical fruit trees that are so heavy with fruit they need to be staked up for support. $28 later, we depart with our bags loaded with fresh produce. LOADED. On this trip, we bought vine ripened tomatoes (perfect for these roasted tomatoes), ruby-colored Cara Cara oranges, Honeybells, pineapple and champagne mangoes… If that doesn’t scream tropical fruit salad, I don’t know what does. Of course, you can use whatever fruit mix you like for this healthy fruit salad, but here are a few of my suggestions. 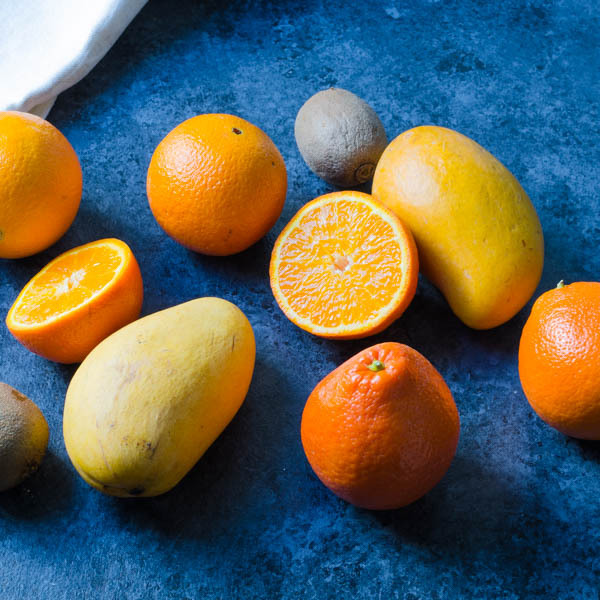 Oranges whatever is available like: Cara Cara, Honeybells, Valencia oranges, Navel oranges, Blood oranges, or Tangerines. Pineapple – use fresh not canned (duh). Mangoes – there are so many different varieties… pick something fragrant and ripe. Dragonfruit – more prized for it’s outward appearance than what’s on the inside, dragon fruit has been compared to an anemic kiwi flavor wise — but combined with other tropical flavor bombs and a hit of rum, it works in a tropical fruit salad. Starfruit – slice the carambola crosswise to get that familiar star-shape. They are tart and crisp to eat. Guava – chunk the guava flesh (minus the seeds) for a glorious pink hue and musky tropical aroma. Later, at home, I peeled, chopped and slurped(for quality control) this tangy sweet blend of tropical fruits. I happened to have some kiwi, so I added it to the mix for a contrast of colors. Why not? Once the fruit is prepped, there’s only one thing left to do… Add the rum! Of course you can have fruit salad just as is, and it’s going to be wonderful, but to take it to the next level, add a few glugs of good dark rum. 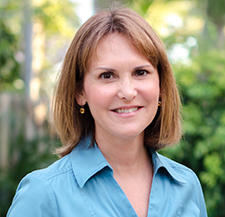 You know, from an island… in the Caribbean. 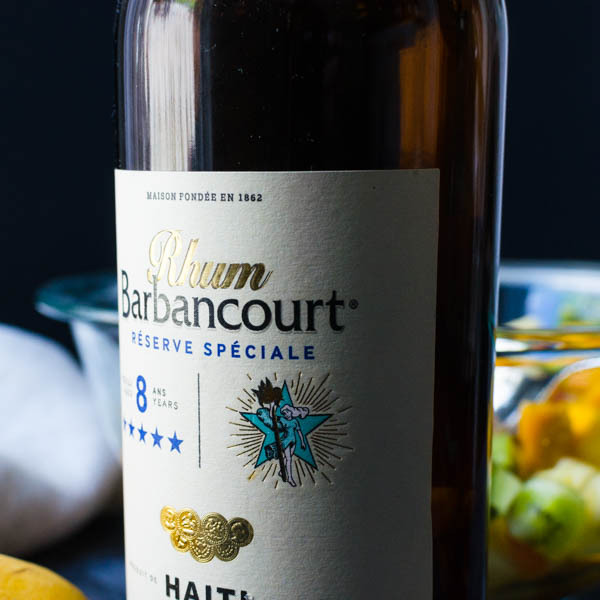 For this salad, I used Barbancourt, aged Haitian rum. It’s smooth and rich with caramel-y notes that play nicely with the tropical fruit. If your fruit isn’t as sweet as you’d like, you can add honey, agave or simple syrup, but since my fruit was candy-sweet, the only embellishment it got was the rum. 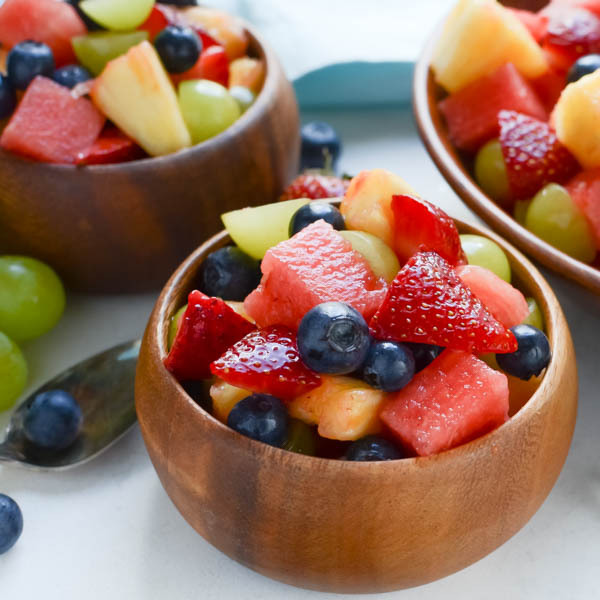 A quick toss and this healthy fruit salad is ready for prime time. 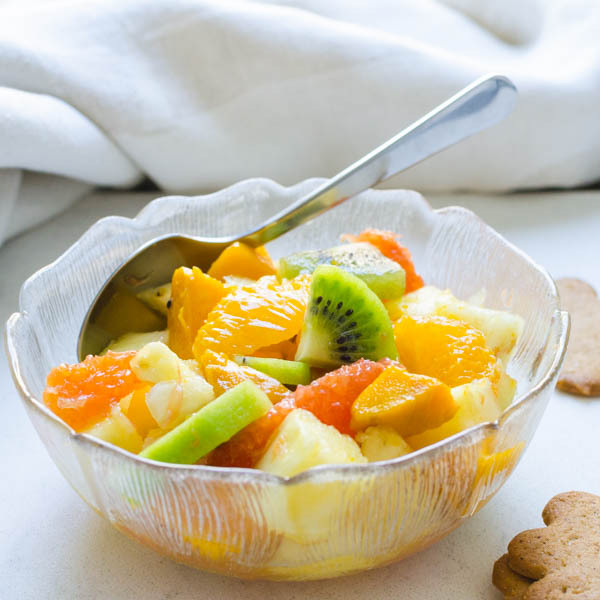 I like a bowl of this tropical fruit salad for dessert with a few thin cookies or spooned over sponge cake and drizzled with the spirited fruit syrup in the bottom of the bowl. Now that’s a serious bowl of fruit, don’t you think? 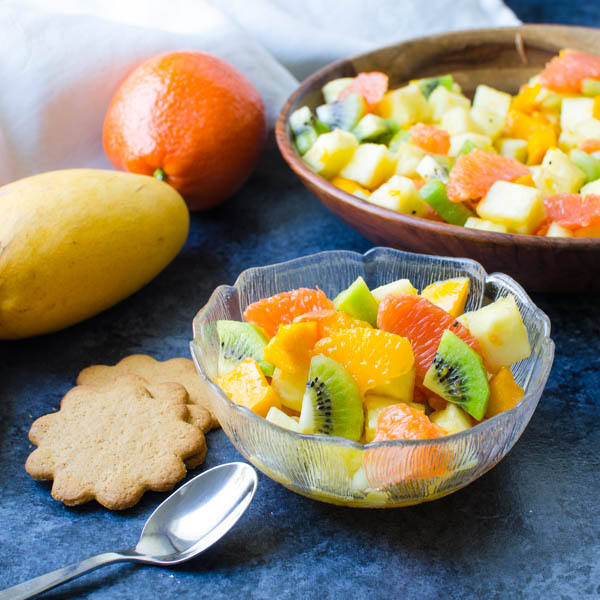 Fresh and light with sweet, tangy citrus, kiwi and mango this easy fruit salad is dressed up with a bit of dark rum. Serve with wafer cookies or over sponge cake for a tasty summer dessert. 4 oranges use a mixture of cara cara, honeybells, blood orange, navel orange or other juicy, ripe orange. Supreme the oranges by cutting away the skin and pith and segmenting the oranges using a very sharp paring knife. 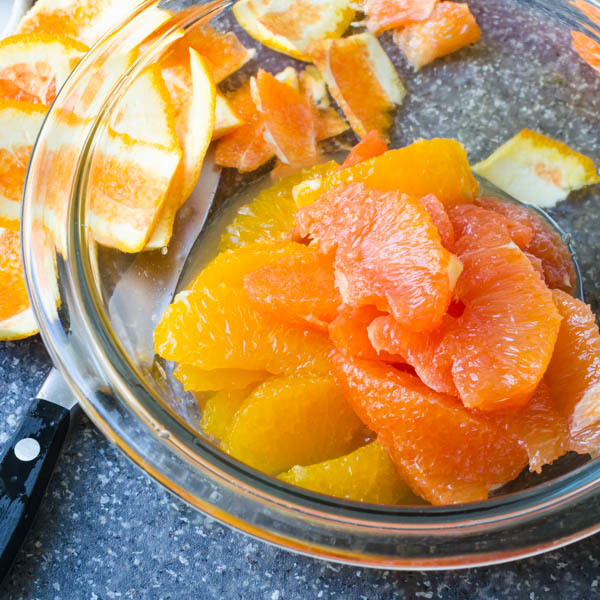 Transfer to a bowl and squeeze the discarded membranes over the bowl to release any remaining juices. 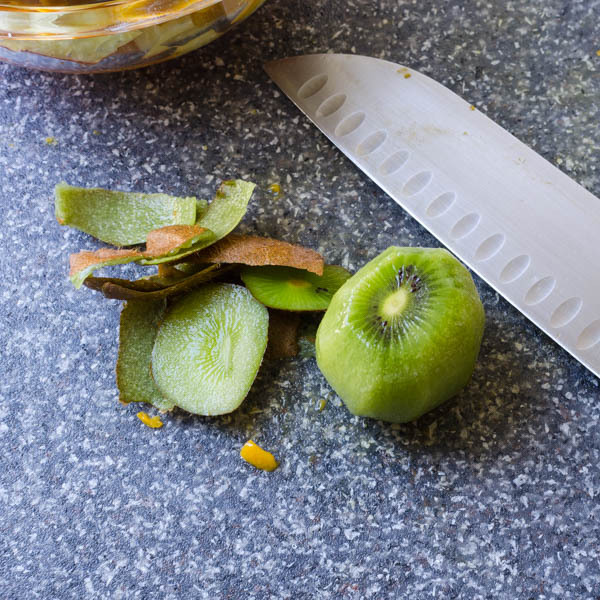 Add the pineapple, kiwis and mangoes to the orange segments and toss. Add the rum and taste the fruit. If it's needs a little more sweetness add honey or sugar one tablespoon at a time (tasting as you go to make sure you don't add too much). Toss to coat the fruit. Cover and refrigerate for an hour to macerate. Spoon fruit into a bowl and serve for a light dessert on its own or with wafer cookies or spooned over sponge cake. Hahaha you sound exactly like me, I CANNOT drive past someone selling fresh fruit on the side of the road. My husband has (finally) learned that if someone is selling some type of fresh food we must stop, regardless of what it is or how late we are running. Some of the best fruit I have ever eaten has been from these roadside stops. This salad sounds delectable, and the perfect grown up dessert to serve next time some friends pop over for a bbq. Like you, I have a hard time resisting a farm stand – I love stopping at roadside fruit and veggie stands and loading up! Rum is such a nice twist on the usual fruit salad – I’ll have to try it – it’s so nice to have a fruit salad out for brunch. This takes me back to a fruit salad my mom used to make. She sprinkled hers with Grand Marnier. The little hint of alcohol was always just enough to turn an ordinary fruit salad into an extra special bite. The spiked fruit salad was always devoured! We’ll have to give it a try with rum at one of our next picnics. Here in Indiana we have vegetable stands more than fruit stands. In the fall we may get apples and pears but certainly not the citrus that you get. The adult tropical fruit salad sounds delicious. It would be great served at a brunch!! I’m pinning. 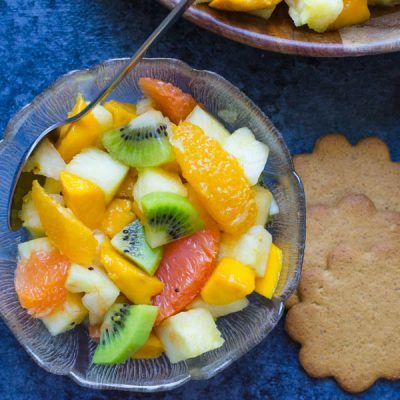 Maybe it’s just the French side of my family, but they never made a separate “fruit salad” for the kids — it was just laced with a taste of rum and that’s the way it was. We are definitely not tee-totalers! LOL! I LOVE this idea. What great flavor ideas you have for this salad, and to make it rum spiked? Yep, I am all in! Can’t wait to try this! This salad looks fantastic! I bet it’s delicious on its own or as a side to some fresh grilled fish! I loved your description of the dragon fruit 🙂 So funny! And the video looks just absolutely enticing! We visited Florida last spring, and your roadside fruit stands are THE BEST. Really, so ridiculously good. We get them here, but only for about 2 months in late summer. And this fruit salad has RUM!? I’m comin’ over to share! Fruit and rum pair so well together. I would eat this for dessert without cake. Over ice cream for sure. Perfect for topping pancakes and waffles for the weekend brunch. What a great adult treat….I will have to give this recipe a try. All of my favorite fruit and they all sound like they would be great spiked. I have to try this recipe. Delicious! Oh this looks fabulous. This would be awesome to serve pool-side to the adults! Thanks! That’s exactly what we do. I adore this! Love the bright colors, and all of that sweet fresh fruit. Perfect for summer! My mouth is watering from this recipe! I would definitely want to eat it over sponge cake. What a perfect summer dessert.